When I stop my alarm at 3:15am I can hear rain outside the window. Over nine months - in which I could almost count missed sessions on one hand - I have trained through all kinds of weather and the one thing I was hoping for, which I felt I deserved by now, was a nice sunny day. But British weather doesn't work like that, does it? So I haul myself out of bed and into some warm clothes. After a cup of tea and breakfast the taxi arrives. We stop to collect Ian Roche and drive through the rain to Pennington Flash for the swim, meeting Will Turton on the way into transition, but I don't see Neil Gray or Dean Hanwell to wish them luck even though I go looking for them. But I am hoping they do well. I feel the nerves building as I check my bike and warm up. I try to deal with them by just concentrating on what I have to do next and not thinking about the whole day. I am not a confident open water swimmer and so the rolling start is a godsend for me, as was Saturday's practice swim. I'm also prone to calf cramp which makes me more anxious about the distance. My plan is to follow the advice of focusing on one thing, and I stick to it. Even as I am warming up and getting into my wetsuit I am rehearsing my breathing pattern, repeating the mantra I learnt from Swim Smooth - Bubble, Bubble, Breathe - and trying to shut everything else out. When called we form a queue of 2500 athletes. Much like a big running race, helpers hold up boards allowing us to self-seed according to our predicted swim time. I take my place and keep looking at the floor and thinking about my breathing. Ear plugs help shut everything out. Just before I move forward to enter the water I see Ian again - we wish each other luck and I walk down the pontoon still rehearsing my breathing, slide in, take a few Tarzan strokes to get going and then put my head down and try to ease into it. All I think about is Bubble, Bubble, Breathe, saying the words out loud into the water to make myself exhale. It works. Usually I have a panic in the first few minutes and have to stop or breast-stroke for a minute but this time I just keep going. I feel like I'm swimming quite well but in place of the panic I feel sick. I put it down to nerves and trust it will pass. It does. I get into my stroke and change to my other mantra of One Thousand, Two Thousand, Breathe Thousand which I use to try and maintain a steady pace. I feel pretty good, there's no washing machine, just the odd bump. The only problem is that at times the rain comes down so hard it obscures the buoys but it's not bad enough to be a major issue. It's a two lap swim. At the end of the first lap I decide to walk around to the second, to keep my heart rate down and take the gel I've stashed in the neck of my wetsuit. The second lap feels good, I get lapped by the pros and think how irritating it must be for them to swim through the pack, but I feel like I'm swimming well. I've taken every precaution I know against cramp (bananas, coconut water, warm-up, compression tights, slow steady kick, foot position) and, like the panic, it never arrives. At the end I think I've swum well. 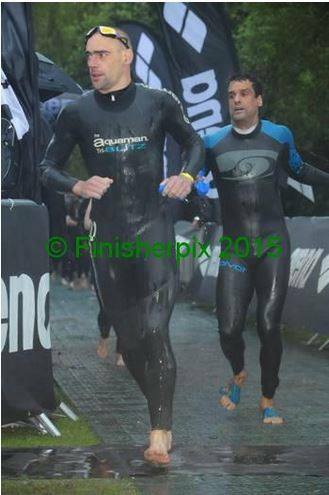 For mysterious reasons I cannot fathom I always swim slower in races than in training. In the docks I consistently swim 3k in 57-59 minutes, so I'm hoping for a swim time around 1:20. Turns out to be 1:31 which I'm surprised about but not disappointed by - I got round without panic or cramp! Entering T1 I am thinking about advice from Jon Moorhouse: relax and stay mindful in transition. So I resolve to take my time and make sure I am ready before heading out, into the rain, on my bike. As I leave T1 a TV camera motorbike is just in front of me and films me as I ride all the way down the narrow, speed-bumped access road that leads to the course proper. So I try to look cool of course and hope he gets a good shot of the 30th Anniversary club cap I've got on under my helmet. My plan for the bike is again simple: stay in Zone 2 as much as possible, nutrition every 20 minutes. And I stick to it. I rotate through gel, banana and fun-size Mars bar every hour, as per training, and keep my effort easy and regular. I've recced the course a few times and one day rode a lap of it and then went up and down Sheephouse Lane five times so it wouldn't faze me. The crowd are great but I stay focused and in the saddle all the way to the top, keeping my effort low, putting myself in a good position to enjoy the fast, curvy descent on the other side. I love that bit - feeling like a kid again, flying down a hill as quick as you dare, just on the edge of control. There's another ascent on the other side and here I have a mishap. My bottle cages are reversible to make them left- or right hand pull. As I go to take a drink, the detachable part comes away with the bottle and there's no way to get it back on mid-race. I curse, then remember Alvin's words: "It's not if something will go wrong, it's what will go wrong, when." I immediately think "If that's the worst thing that happens to me today I'll be doing alright", stuff the bottle in my back pocket and carry on towards Hunter's Hill where I know our club support will be. Going up it I mainly stay in the saddle again, keeping a rhythm, ignoring the shouts to "Smash it", standing up briefly really just to have a stretch and change of position, then when I get to the top it's high-fives and smiles all round. The second lap passes without incident although the blustery conditions make for hard going. As I come into T2 my family are waiting for me and I make sure to stop for hugs - they have tolerated my selfish training regime incredibly well and it's a few seconds well spent. My bike split is exactly what I'd hoped for, which is great given the conditions and the big swim beforehand: 6:26. I take my time again in T2, changing my top, tending to a blister, eating an Alpen bar. My legs feel good and I start running straight out of the tent and onto the course, which begins with a nasty little hill up through a small housing estate. I remember Bryan Riley saying he walked up it, and this, together with sufficient experience of hilly runs, makes me decide to walk it to. 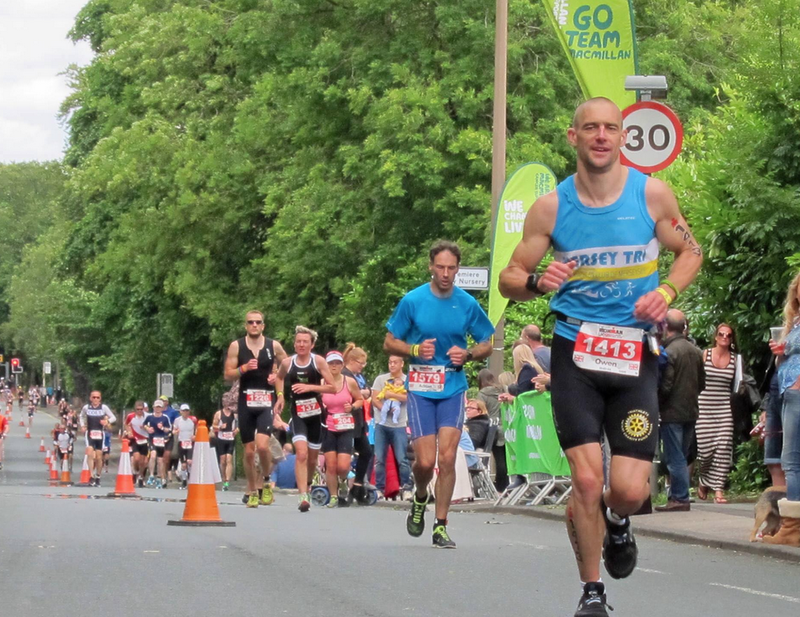 There is nothing to be gained from running up steep hills in a marathon: even fellrunners walk sometimes. Once out on the main road I start running again. Bryan also told me I would feel good at this point and be tempted to go out fast, so I say to myself "gentle jog" and this is my mantra for the start of the run. I keep a steady 5:00/k pace (I'm a good runner and this is very slow for me) and my legs feel strong but I quickly hit two problems. First, the sun finally comes out, it gets hot, and I'd decided not to wear my cap because there was no sign of the sun before. I worry this might be major mistake. Secondly, stomach cramps. I'm used to eating Alpen bars but think maybe that one was a mistake too. So I resolve not to eat until the discomfort passes, sticking to sips of water. The route passes through suburbs, where kids with hosepipes and supersoakers help with the hat issue, and then along a canal towpath with nice shady bits. Eventually I stop worrying about the sun. There's another nasty little hill back up onto the main road and the start of the three six-mile laps that will complete the run. It's a tough course. Half the loop is a long, steady incline with a couple of extra-steep bits near the town centre thrown in for good measure. I walk those and just try to keep a regular pace for the rest. After an hour I've still got stomach cramps. They're not going away but they're not getting any worse either. I don't think I can run a marathon without fuel so I decide to risk a gel. The level of discomfort doesn't change so I revert to Plan A - a gel every 20 minutes for the rest of the race. 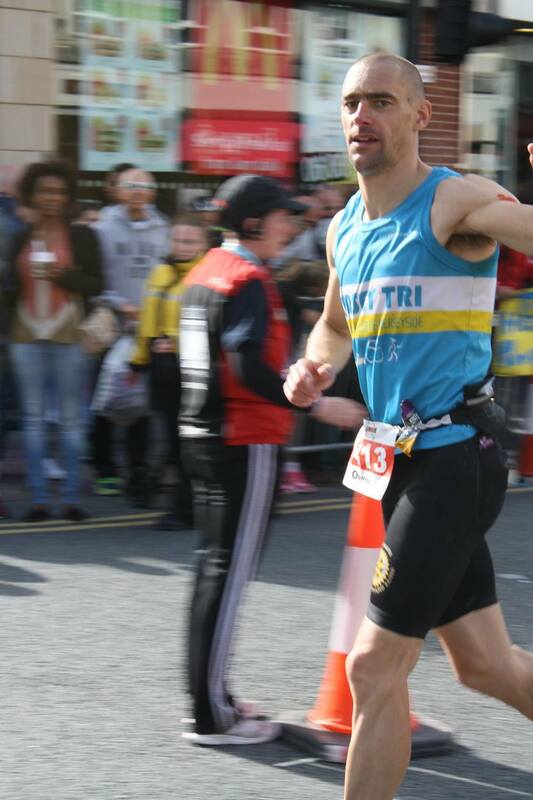 Shouts from the crowd, and especially the Mersey Tri crew, really help keep me going. By now Dean and I are seeing each other on every lap. When he tells me "It's getting tough now" I know it must be hurting: this is not a Dean-like thing to say (he's a Yorkshireman, after all). But after a lap I know I'm going to finish and do ok. I take time for hugs with the family again as they wait near the chute. So I tap out the final laps, picking up the pace a bit for a big finish, knowing it's downhill almost all the way in, feeling little bursts of that indescribable emotion that arrives at times like these. You know the one. One last high-five with the kids and I'm running into the finish chute, arms aloft, not even looking at the clock. Turns out I ran a 3:54 marathon to finish with 12:19:04. After I cross the line I'm expecting to be overwhelmed - I'm expecting to have a little cry to be honest - but that doesn't happen either. Instead I feel immensely satisfied and deeply, deeply happy.